This item is specially packaged to remain refrigerated during transit. 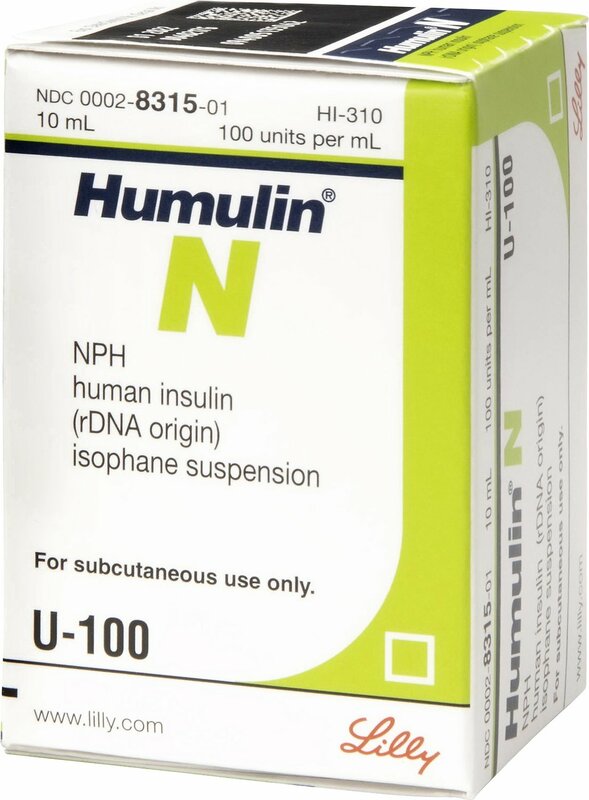 Humulin N Insulin is an injectable prescribed for the treatment of diabetes mellitus that helps to maintain normal blood sugar. Humulin N Insulin allows the blood sugar to be properly used within the body by allowing the blood sugar to enter the cells so it can be used for energy. Insulin is used for the treatment of diabetes mellitus. Regular insulin is commonly used for stabilization of the diabetic pet and is the only formulation labeled for intravenous administration (IV); it is also administered by intramuscular (IM) and subcutaneous (SC) injection. Adverse effects of insulin therapy may include hypoglycemia, insulin-induced hyperglycemia (“Somogyi effect”), insulin antagonism/resistance, rapid insulin metabolism, and local reactions to the “foreign” proteins. Notify your veterinarian of any other medications, including vitamins and supplements, your pet is taking while receiving insulin. Do not inject insulin at the same site day after day or lipodystrophic reactions can occur. Do not change the pet's food, feeding schedule, or exercise schedule once regulated for that food and schedule. Do not use any insulin that has been frozen or exposed to direct heat or light. Make sure you are always using the appropriate type of syringe for the type of insulin you have. This drug is FDA-approved for human use. However, it is common practice for veterinarians to prescribe such drugs for use in dogs and cats. Use according to your veterinarian's instructions. Doses vary considerably between animals. In some cases, insulin may need to be given twice a day; it may need to be given at higher doses to get diabetes under control, then decreased; or doses may need to be increased over time. Store in a 36° - 46°F refrigerator, but not in the freezer. Humulin N is a man-made insulin that is used to control high blood sugar in pets with Type II diabetes. Your pet has an allergy to Humulin N or any of the ingredients in Humulin N.
Before you start administering Humulin N, talk to your vet about your pet's low blood sugar and how to manage it. How should my pet use Humulin N? Read the instructions that come with your Humulin N. Use Humulin N exactly as your vet tells you to. Know the type and strength of insulin you're using. Do not change the type of insulin you use unless your vet tells you to. Monitor your pet's blood sugar levels. Ask your vet what the blood sugars should be and when you should check. The Humulin N dose may need to change because of: change in the level of physical activity or exercise, weight gain or loss, increased stress, illness, change in diet.